Registering qualifies you for a $500 Gift Coupon discount for our next upcoming Certification Training (automatically applied at enrollment). Our gift to you! PLEASE BE ASSURED: Your Email info is never sold or shared, or used to spam. As you watch your EMF Certification Intro Video, you'll probably want to have your EMF CONSULTANT TRAINING INFO PACKET handy while you watch the Webinar - it's where all the most current discount offers, scholarships, prices, syllabus, instructor bio and course offerings are kept up to date. Haven't got your copy yet? Simply "REQUEST Your "Training Info-Package", right here. You'll also enjoy get acquainted with your EMF Consultant certification training instructor, Chris Young, retired Senior Professional Engineer, and his casual, easy-to-follow teaching style. This was the same easy leadership style that brought Chris high-level corporate success spanning the world, heading up various electrical engineering and power companies, in particular working with major Electrical Utilities where he was dedicated to the goal of making electrical energy more efficient and safer for people. 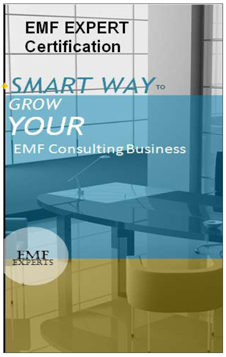 So, sit back with your favorite cuppa and enjoy 35 minutes of insight and inspiration, recorded live and posted for anytime viewing convenience, for all those who've asked, "What would my life be like as a Certified EMF Consultant"?